With no license to trade in the UK, as a barber you are responsible for the health and safety in the barbershop. A few months back I jumped into a barbershop for a trim up. The cut was good but the hygiene was shocking. That evening I felt myself itching the back of my head as I watched the TV. If I were a normal client I never would have returned. I always say to my staff “a clean shop is a happy shop”. All equipment must be sterilised before use! Clipper blades should be sprayed with a disinfectant spray and regularly oiled. Also clippers can become unaligned, especially if you travel with them. You should check that the blades are aligned properly or they will cut clients. If you do take your clippers home, put them in a secure box so the blades can’t move around. Always change your Barbicide regularly. Barbicide is diluted similar to how you would dilute squash – one part Barbicide to eight parts water and leave your tools in the solution for 10 minutes. When you take your tools out, use a tint brush to clean in the hard to reach areas. Milton sterilising tablets are a great way of sterilising your shaving brushes. After they have come out of the liquid, put them in a UV steriliser - your hot towel machine should have this. ‘One man one blade’, use this slogan, tell your friends and lets spread the word. No matter how little a blade is used, it is ONE blade PER customer. So even if you use the blade just to go over the client’s neck hair, the blade needs to be changed. I know some of you will use expensive blades, so you may need to switch to run of the mill cheaper blades for necklines to save those pennies. After use, your blades MUST go in a yellow sharps box which will need to get disposed of properly. I have spoken to wet goods companies who tell me that landfill sites have given them a telling off because blades have been found in their empty containers. You can buy a yellow sharps box from your local wholesalers for under a tenner. Glove up! When shaving you should be wearing protective gloves. Try using a smaller glove so the fit is nice and tight. If you start shaving wearing gloves it will just become second nature. When completing nationally recognised qualifications, you will not pass a shaving assessment without wearing gloves and you may even find your insurance would become invalid. Consultation, consultation, consultation! A thorough consultation at the start of the service will allow you to look at the hair and see if the client has any contra indications. Remember once you have started a cut with headline present in the hair you have to finish it. Using a proper barbers chair (with reclining back) will save you years of discomfort and enable you to carry out beard trims and shaves more effectively. Adjust the height as often as necessary to ensure that you are comfortable. Your electrical equipment should be visually checked before each use to ensure it is of safe standard. Although it is not law to get them PAT tested, it is good practice to get all your electrical equipment tested annually as some defects can only be found by testing. Also remember you MUST have valid insurance. If you’re self-employed you should have your own insurance. I use Gary Crowder at Just Hair Insurance. I could go on and on, but as I have said before with 27 years as a barber and 12 years teaching barbering I would really like to make this column as useful as I can and help my fellow barbers. If you would like anymore guidance on the rules of health and safety in the barbershop you can get my book in all Salon Services stores around the country. Also, if your salon or barbershop takes on work placements from your local college then the chances are you have had someone in from the college doing health and safety checks on your shop. This is a great way to confirm you are complying with all regulations. Firstly, if you want to teach the nationally recognised qualifications you must have the qualifications yourself (ie, if you want to teach the Barbering NVQ Level 3 – you must hold this qualification yourself or you cannot teach it). I know this can create tension amongst some of the more senior barbers as many of you have plenty of experience without a qualification but I have honestly never anyone that has finished these qualifications and not learnt a thing. As well as teaching barbering skills, these qualifications will also teach the essential knowledge behind the skills as well as how the qualifications work, how they are put together, methods of assessment etc, - as the saying goes… He who dares to teach must never cease to learn. I have heard a lot of people say that these qualifications are not very good, but the barbering NVQ’s are among the best qualifications in the world. Once you have gained the relevant qualifications then you will next need your TAQA - this is an award in training, assessing and quality assurance and has replaced the A1 and A2 assessor awards. This qualification allows you to assess the students doing their qualification and to complete this qualification you will need access to a learner who is currently studying. Along side your TAQA you will need to do your Education and Training Award. This can be done through distance learning or a short-term course. My local training centre delivers this over 10 weeks for one evening a week. This course will cover preparation, planning and basic course design and you will need to deliver a micro teaching session. There is a lot to do so if you are serious about teaching then this should help point you in the right direction for what you need. My advice would be approach your local training provider or college with all of this in mind and maybe see if they will help you achieve your dream. If you’re a barbershop owner, a great way to test the waters about teaching is to take on an apprentice. Not only will you get great staff that works your way but it is also a fantastic way to see if you enjoy teaching. When you employ an apprentice, you will need to enrol them into a college or training centre that will take them through their qualification whilst you can help teach them in the barbershop which will help you get to know the qualifications and delivery. 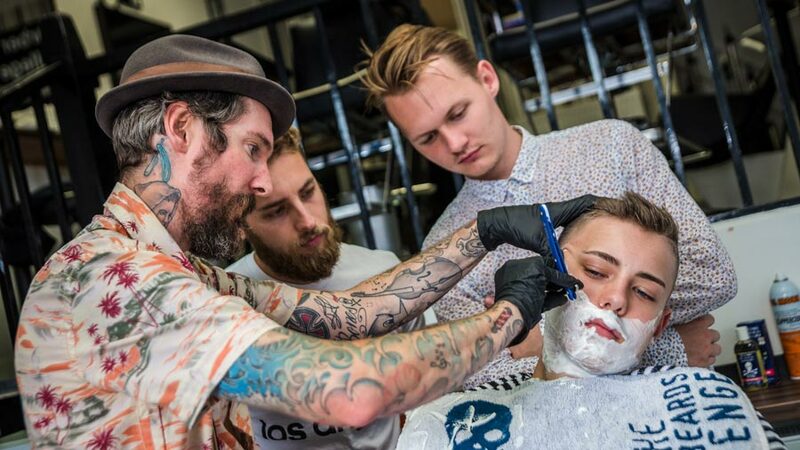 There has never been so many young people looking for a barbering apprenticeship – in fact a lot of colleges are now experiencing more learners enrolling onto their barbering courses then hairdressing. Taking on an apprentice can be really rewarding and it’s the best way for someone to get into the industry. Barbershops today have many other services going on, such a shaving, that the apprentice can help with and I find that my clients love to see an apprentice come through the ranks of the barbershop. There is also a government grant where you can apply for £1500 to support businesses enrolling an employee onto an apprenticeship programme. A similar question I get asked is ‘how do I become an accredited centre?’ This is a lot more difficult. The first step is to approach the awarding bodies such as VTCT or City and Guilds and check that you meet the criteria and agree to their terms. If you feel that you do then you can apply and arrange an appointment for them to come and see your centre and they will show you what needs to be put in place. My advise would be to not run before you can walk… learn how to teach first and be comfortable with teaching before you apply for centre approval. Here goes! Let me introduce myself – my name is Mike Taylor and I have now been a barber for over 27 years. It wasn’t cool to be a barber back then and many people wondered why I wanted to do it - but I loved it. I used to love going to the barbershop and cut my friends hair at school. Having the ability to make someone look and feel better is a great thing to be able to do. Having opened my first barbershop at the age of 20 I really worked hard to make it a success. I even gave up my rented house to crash on a mates sofa and sold my car so that I could afford to take the plunge and there’s not a day I look back and regret it. I now own 8 barbershops across Hampshire and Dorset and my own training academy in Poole, Dorset. It was having my own shop which took me down the route of teaching. I used to struggle to find decent staff so I decided to teach at my local FE College. They wanted to start teaching the Barbering Qualifications when they had recently been launched and wanted a barber to help train the students. I have a big passion for teaching and am impelled to raise the standard of training in the UK. Last year I launched Mike Taylor Education and now teach Barbering NVQ’s, apprenticeship training and other technical short courses both at my academy in Poole and at salons, barbershops and colleges across the UK and further afield. To me there is no better feeling than when I have taught someone from never having held a pair of scissors before to getting their first job in a barbershop. I have also just helped launch The Great British Barbering Academy, with this we aim to be able to provide barbering education all over the world with our team of top class educators. Now, you have probably heard of an organisation called the British Barbers’ Association (BBA)?! The BBA was launched in 2009 by myself, Hannah Grigg and Graham Satchwell with one aim – to create a voice for British barbers. At this point it seemed that other trades – including hairdressing, had associations and federations that supported the workers but no one was looking after barbers. Now there are many different groups that all hope to better the industry in some way and although I no longer work with the BBA I still believe that these industry groups are a great thing and should be embraced by us barbers – not feared. Barbering and hairdressing is the most employed sector in the UK but unbelievably we’re not regulated and I personally think it speaks volumes if a barber makes a choice to join these groups voluntarily. British Barbers Association – As I said I founded the BBA seven years ago because I felt nobody was looking after barbers and I wanted to give them a voice. I felt that, at the time, we were considered a poor relation of hairdressers, both by the public and the trade. That’s why I felt passionate about forming an association where barbers could have their work recognised. Men’s Hair Federation – The MHFed have a team of young barbers called The Young Feds, recognising young talent coming into the trade. They are fast becoming a sort of fellowship of barbers. These guys are usually on the big stages at trade shows. British Master Barbers – They aim to recognise outstanding talent and use social media very well to showcase a lot of barbers’ work. Also have fantastic competitions to showcase barbers talents. National Hairdressing Federation – They were formed many years ago by barbers. They do a lot of good work in helping with contracts and employment laws. They seem very big on looking after barbers once again. Great for employment law, staff contracts, NHF are very professional and there is not much they do not know about running a barbershop. The Hairdressing Council – This is the only government backed authority. It campaigns for barbers and hairdressers to be licensed. You can now opt to be a state registered barber and it has a Barber Council sub-committee. As I have said above, I truly believe that these organisations are here for the good of the industry. With this trade we never stop learning and when you think you know it all in the trade that is the time to give up.